When I decided to take on the Blogging From A to Z Challenge, I figured I’d have trouble coming up with topics for some of the letters. But for the letter H, it was a no-brainer. I’d once again discuss the topic that for some unknown reason draws the highest volume of traffic to the site. That’s right! It’s time once again to talk about the Scourge of McDonaldland himself – The Hamburglar! I’m sure that most of you have always wondered how the Hamburglar got his stripes. What’s that? Nobody in the history of mankind has ever wondered that? Oh. Well, you can watch this video anyway. 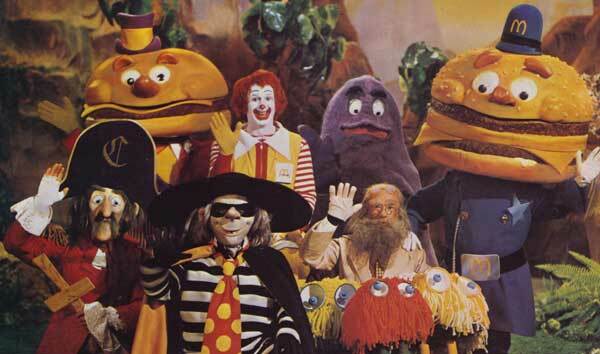 Apparently, they made a few animated movies about the McDonaldland characters. Here is how the Hamburglar looks when animated:Maybe it’s just because the image is taken out of context, but am I the only one who finds this to be somewhat unsettling? I’m not sure what Mayor McCheese is thinking here. The Hamburglar wants hamburgers! You may think you’re punishing him by shooting him with that gun, but you’re merely playing into his hands! This seems a bit overdramatic. Hamburgers cost less than a dollar at McDonalds. I don’t think having one stolen is a soul-destroying trauma. If anyone has found other good Hamburglar pictures, please feel free to share! I am the Cutter. I write some stuff. You might like it, you might not. Please decide for yourself. This entry was posted in Randomness and tagged Blogging from A to Z Challenge, Grimace, Hamburglar, McDonalds. Bookmark the permalink. 4 Responses to H is for….HAMBURGLAR! No treatise on the Hamburglar is complete without showing off the mess he looked like during the LSD inspired days of the early 70’s…. That’s our friend between Cap’n Crunch and Jerry Garcia…. I’m just disappointed they didn’t include classic characters like Disgruntled Goat and Ku Klux Klam! I thought that second image was one of the kids from “Rugrats” dressed as the Hamburglar. The pic Squirrel just posted has killed me though. And it has also made me wonder about the anatomy of the whole McCheese family. I also thought it was a Rugrat dressed as the hamburglar at first! Categories Select Category 31 Days of Blogging Alliance of the Damned Awesome Stuff Fiction Guest Posts Guide to Fixing America politics Pop Culture Randomness Sports The Cutlet Trips and Events Twins Weekcap Who won the internet?